Get 3D printed parts in a day from Fictiv. We also offer instant quotes, live technical support, and easy checkout with a credit card or purchase order. Perfect for early stage prototyping on simple geometry parts, made out of biodegradable corn starch. 3D print multiple iterations of an early stage part design. 1-day turnaround. Cost-effective plastic for initial prototyping applications. Great for mechanical strength and early stage rough prototypes. 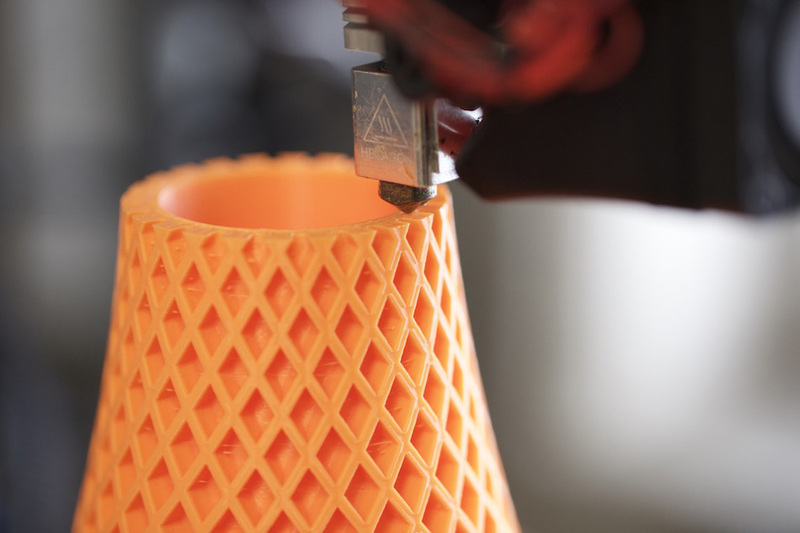 With post-processing options, ABS can offer a better surface finish than PLA. 1-day turnaround. Strong, durable synthetic 3D printed polymer material, with some flex. Great for snap fits, brackets, clips, and spring features. Nylon is also used for its thermal applications and can withstand temperatures up to 177℃. 3-day turnaround. High resolution 3D printing material that's excellent for checking your prototype's fit and accuracy. With its 16 micron resolution, this material works great for visual models, especially if they require painting. Vero is printed using PolyJet 3D printing technology, meaning that parts are made from a photopolymer resin and cured with a UV light. Same-day turnaround. Quick-turn translucent materials, fabricated using Polyjet 3D printing technology. Replicate clear parts or create light pipes that need to diffuse light over a distance. VeroClear parts can be manually sanded and painted for more clarity. 1-day rush turnaround; 2-day standard turnaround. Strong, durable material, with the same high resolution appearance as VeroWhite. Fictiv’s closest representation of Injection Molded ABS in a printed material. Great for simulating ABS plastics with higher temperature resistance and toughness. 1-day rush turnaround; 2-day standard turnaround. Rubber-Like gives you full flexibility of parts and allows you to simulate rubbers between Shore 27A and Shore 90A, although it doesn’t have the same elastomeric properties as rubbers. Great for testing overmolds. 1-day rush turnaround; 2-day standard turnaround. Read about our platform capabilities for 3D printing, across material properties and finish details, design recommendations for different processes, and more. Upload your digital CAD files and compare the cost of different 3D printing materials and technologies for rapid prototyping. We provide same-day production and delivery for Vero 3D printing material. "The support from the Fictiv team was awesome—I felt like I could ask anything about any process and become very informed. Fictiv was very forthcoming about what was best for our project needs." Fictiv’s quote-to-order hardware development platform provides instant pricing feedback. Get 3D printed parts from upload to delivery in under 24 hours, and get 100-50,000 injection molded and CNC machined parts in weeks, not months. Fictiv’s distributed network of high quality overseas and local manufacturing partners offer a range of industry specialization. Fictiv is based in San Francisco, with offices in Portland, Oregon and China.